England all-rounder Ben Stokes has been ruled out of next week's third Test against Pakistan with a calf injury. 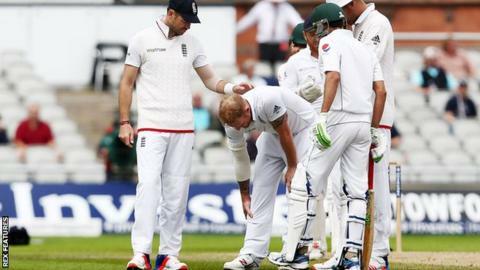 The 25-year-old was injured while bowling on day four of the second Test at Old Trafford, which England won by 330 runs to level the series at 1-1. The Durham player will have further tests next week to determine the severity of the injury. Seamer Jake Ball is in a 13-man squad for the third Test, with paceman Steven Finn and leg-spinner Adil Rashid. This is Stokes' third notable injury in the past nine months. He damaged his shoulder in the third Test against Pakistan last October, and consequently missed the four-match one-day international series and three-match T20 series. The all-rounder then injured his knee in the first Test against Sri Lanka in May, which resulted in a month on the sidelines. Stokes made his competitive return in a T20 Blast fixture for Durham on 24 June and played five T20s and two first-class games, but was left out of England's squad for the first Test against Pakistan, which the visitors won by 75 runs. He is walking unaided, but England will wait until next week to make an assessment. England's 13-man squad for the third Test against Pakistan: Alastair Cook, Moeen Ali, James Anderson, Jonny Bairstow, Gary Ballance, Jake Ball, Stuart Broad, Steven Finn, Alex Hales, Adil Rashid, Joe Root, James Vince, Chris Woakes.